I have said this before and will probably do many times over in future too, that blogging has brought me to know some really lovely people whom I would have never met otherwise. Deesha of Vegetable Platter, whom I fondly call “Dee” is one such person. For all you know, I discovered and connected with Dee on twitter and happily so. Dee happens to be from my city, one of my more favorite places in the whole world – Bengalooru (Bangalore). Now, that is not just the mere reason we connected. Dee is a great cook, a veteran blogger (has been blogging much much before I had even started a blog) and has lovely recipes and beautiful pictures on her vegetarian food blog and mouthwatering home style Karnataka recipes Nucchinunde, Halbai, Gojjavalakki, Akki tari Uppittu to name a few. You’d never find those in retaurants! Not just that, she has a keen eye for some cool traditional brass and copper props too.. 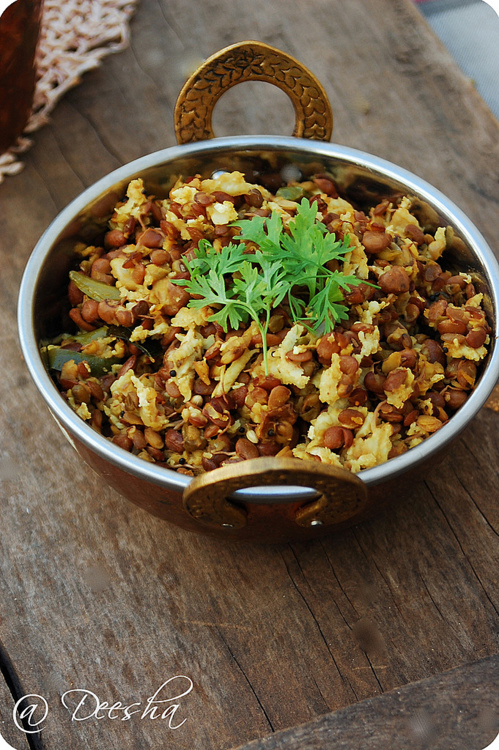 Being from Bengalooru, a colloquial shortcut for “Benda kaalooru” (in olden days) which translates to “a city of cooked lentills”, quite aptly she is bringing today, a very classic and typical Bengalooru dish and her childhood favorite – Hurali Saaru. Thanks a bunch for guest posting such a local recipe, Dee. I am so homesick now! Even though, I have been following Just Homemade for quite sometime, I connected with Radhika quite recently and I am glad I did. I love her blog and she is as lovely as her blog. And, I am quite thrilled to be writing a Guest Post on Just Home Made – A blog with some very beautiful photography and awesome recipes. When Radhika asked me to pick a childhood favorite recipe, it didn’t take very long for me to decide, Hurali Saaru it is going to be! 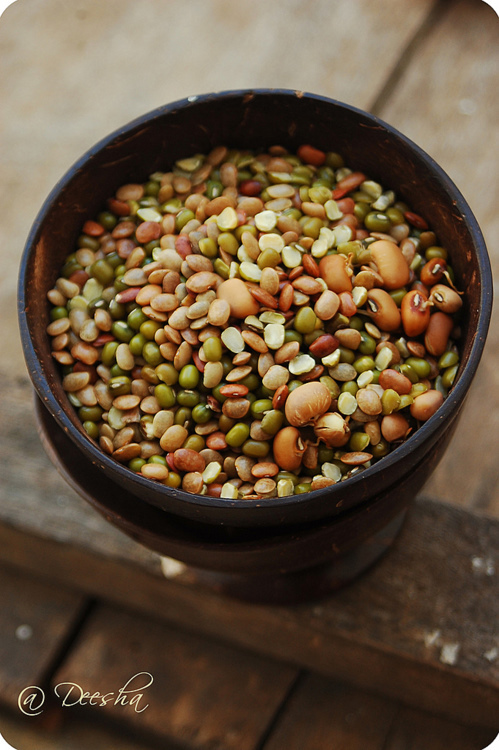 Hurali Saaru makes use of Horse Gram as the main ingredient along with Mung Beans & Black Eyed peas in smaller quantities. 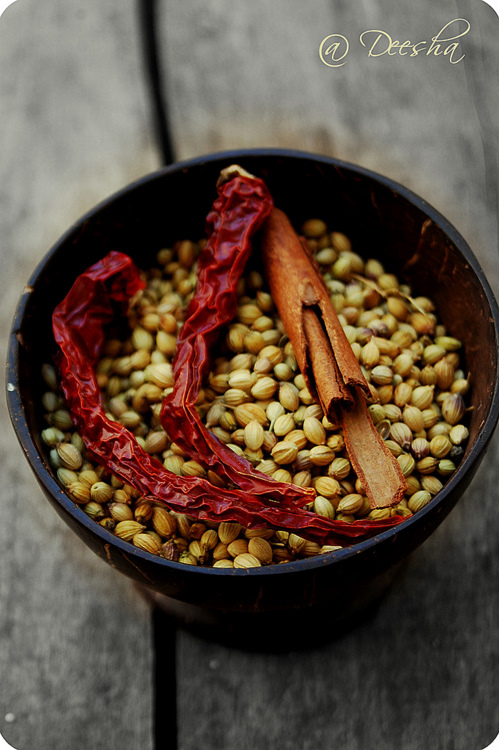 Once these pulses are cooked, a portion of these are ground along with coconut & spices & made into a Rasam/Saaru and the remaining portion is made into a Usli or a quick Stir fry that is served along with Rasam & Rice. And, according to Ayurveda, Horse gram generates a lot of heat in the body, which is why it is mostly made during winter/rainy season. My maternal Grandmother or Ajji as I call her in Kannada makes one of the best Hurali Saaru I’ve ever eaten & undoubtedly, she is the one who taught me how to make this. Let’s jump to the recipe shall we? Drain & sprout them using a sprout maker or in a colander, covered with a lid. Pressure cook pulses with a bit of salt until soft yet firm using 3 glasses of water. Drain the water for later use & set aside the pulses. In a pan, dry roast red chilies, coriander seeds & cinnamon until aromatic. In a pot, add the water that was set aside & bring it to a boil. Add the ground paste, salt & 2 tbsp of cooked pulsed & simmer for about 10 mins. 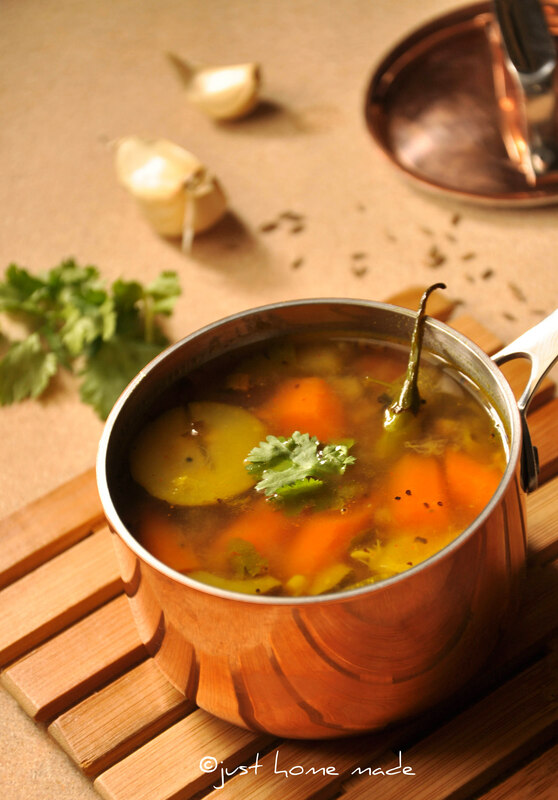 Add 2 more glasses of water as you simmer to get a Rasam like consistency. In a Kadhai, heat oil & splutter mustard & cumin seeds. Add Hing & curry leaves & saute for 10 secs. Add cooked pulses, grated coconut, Salt as per taste. Mix well. NOTE: It is not mandatory to sprout the pulses. You may soak them for about 2 hrs & make this but sprouting them definitely adds to its nutritional value. 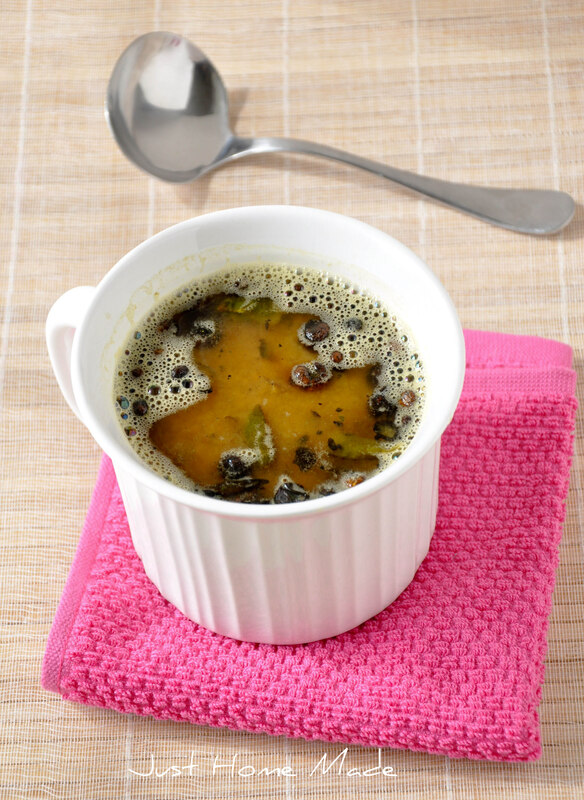 Lovely recipe…I indeed miss Bengaluru now 🙂 Thanks for introducing me to another veggie blog with some great traditional recipes! oh! pics looks so yummy =) Indian food the yummiest. Yummy….and healthy too….will definitely give it a try this week!!! Lovely post Deepthi 🙂 Though I’ve spent 3 years in Karnataka, never had a chance to have this. I so wanna try this ! Gorgeous pictures Deesha.. with lovely and healthy dish. What a wonderful way to showcase more staples and the wonderful spice combos that bring them to life! 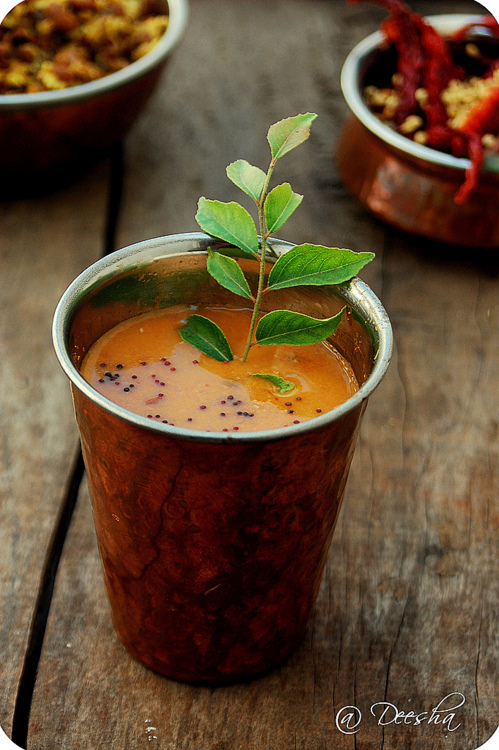 I am always on the hunt for beautiful and authentic Indian recipes like this. If you do not have a pressure cooker I imagine stovetop instructions to be similar? Thank you! Yeshtu Chennagide! Your photos are amazing! Which cam?? I always wanted to make a Huruli Saaru at my own home..brings back some wonderful memories from my childhood. Thank you for the nice post. I can’t wait to give it a try. But I’m wondering though if it is possible to substitute black eyed peas with chick peas or other types of beans? Thanks! Found your blog while searching for care information on a curry leaf plant. What a wonderful find! I am excited by the recipes– and even more so since everything is vegetarian (I was raised vegetarian since birth). And I see you even made a visit to my fair state, Arkansas, last fall. 🙂 Looking forward to checking in on your blog on a regular basis. Found ur blog very helpful indeed to impress my in lows. Aparna, thanks for writing.. Very happy they liked it! Recipe tumba chaanag ide.. Huruli saarige mensina kaalina khatta khara bidre, gantlige baala volledu.. Bahushaha naavugalu nam hale tindigalanna maritidivi!! Dayavittu adna blog maadi, eegina peeligege hale tindi madodu gotagli, hale beru hosa chiguru antaralla, haage!! Nange gottiro kannadigare vobru ‘online supermarket’ tegdidaare. Adu http://qusec.in/. Kannadigaranna protsaaha madona. Hale tindigala bagge vondu jaagruti moodisona. Dhanyavaada. 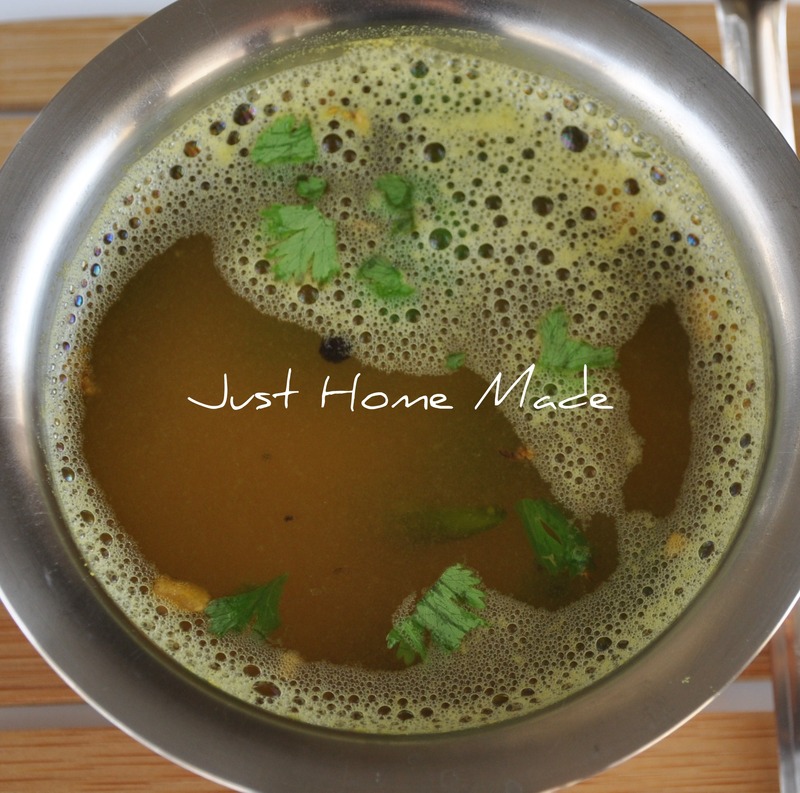 make oggarane with mustard seeds in Table spoon of Til oil. eat piping hot with a spoon of raw til oit. serve with Aealu sandige .